Annissa Essaibi George celebrated at her home in Dorchester. Stephen J. Murphy and Charles C. Yancey, the Boston City Council’s longest-serving members with a combined half-century at City Hall, lost their bids for reelection Tuesday to two women who have never held elected office. High school teacher Annissa Essaibi George beat Murphy to capture the fourth at-large seat representing the entire city. 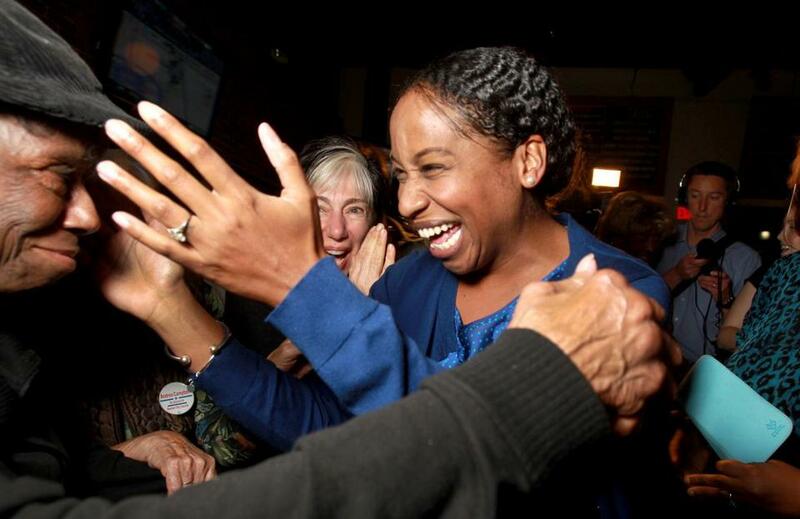 Attorney Andrea Joy Campbell defeated Yancey in District 4, a seat representing Mattapan and Dorchester that the incumbent had held since it was created. The results will double the number of women on the 13-member council, to four. Essaibi George, a 41-year-old mother of four, has taught health, economics, and other electives at East Boston High School since 2001. She also owns the Stitch House, a yarn emporium on Dorchester Avenue. Voters re-elected the mayors in Brockton, Gloucester, Quincy, and Waltham, but turned to challengers in Revere and Weymouth. 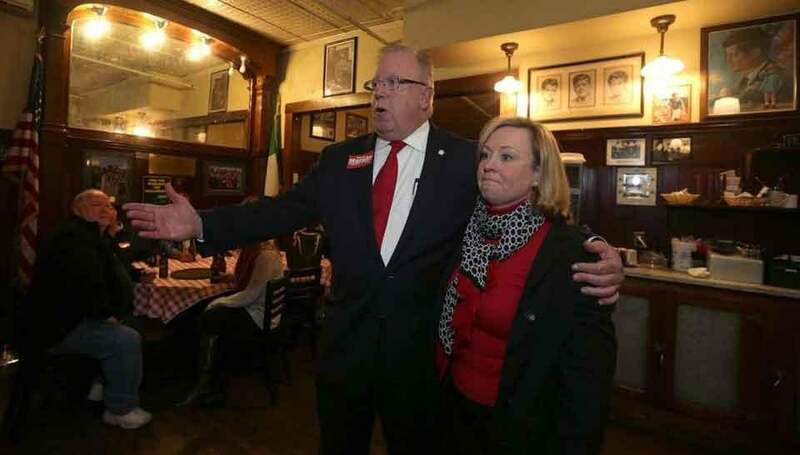 Murphy, who has served as an at-large city councilor since 1997, conceded defeat at Doyle’s Cafe in Jamaica Plain as his wife, Bridget, stood beside him in tears. Campbell is an Ivy League-educated lawyer who in March began knocking on doors in District 4, which also includes slices of Jamaica Plain and Roslindale. Campbell beat Yancey by 23 percentage points. “The real hard work now begins, to truly move the needle on the issues this community needs the needle moved on,” Campbell told supporters. Yancey did not start campaigning until he finished a distant second in September’s preliminary election, but his desperate fight to save his seat fell short. Campbell’s hustle and promise of better constituent service proved too much. In the citywide race, Councilor Ayanna Pressley topped the ticket with the most votes for the third consecutive election, capturing her fourth term in a victory that could be a springboard to higher office. The 41-year-old Dorchester resident has championed the plight of women and children in crisis. “It is incredibly gratifying to see Bostonians stand up for our shared agenda of equitable economic development, safe and healthy neighborhoods, and cooperative government,” Pressley said in a statement. Councilor Michael F. Flaherty Jr. captured his seventh term on the council and finished third. At age 46, Flaherty pitched himself to voters as a bridge between old Boston and new Boston. “I’m grateful to go back to work for the people of Boston,” Flaherty said. Despite warm weather, voter participation was so anemic the city neared a modern low for turnout. 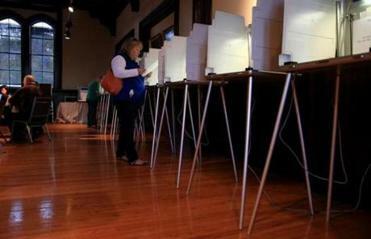 Just over 50,000 people cast ballots, which represented 14 percent of registered voters. The previous nadir was 2007, when just over 46,000 people — or 13.6 percent of registered voters — cast ballots. Andrea Joy Campbell greeted wellwishers at her election night party at the Blarney Stone in Dorchester. This week, Councilor Frank Baker proposed eliminating City Council-only elections because he said it was a waste of money when so few people vote. Baker filed a measure that would extend councilors’ terms from two years to four years so council contests coincide with mayoral elections, which often attract twice as many voters. The other incumbents who faced challengers — Baker, Tito Jackson, and Timothy McCarthy — easily vanquished their opponents. The story of election night was the ascendance of two political newcomers who out-hustled entrenched councilors and knocked them out of office. Since the council adopted its structure in 1984, only a handful of incumbents have lost. Essaibi George campaigned with a focus on the city’s high schools and pledged to bring a teacher’s perspective to City Hall. She first ran in 2013 but finished fifth, losing to Murphy by about 14,000 votes. This campaign, Essaibi George said she started earlier, raised more money, and met more voters. Murphy had held a citywide seat on the council since 1997, when he filled a vacant seat and joined the body midterm. Murphy made several unsuccessful bids for other elected offices but managed to hold his council seat. The Boston Globe analyzed public records and determined that Murphy attended few council hearings and spent big chunks of winters at his Florida condominium. He also gave his friend and neighbor a $75,000-a-year job in his office. 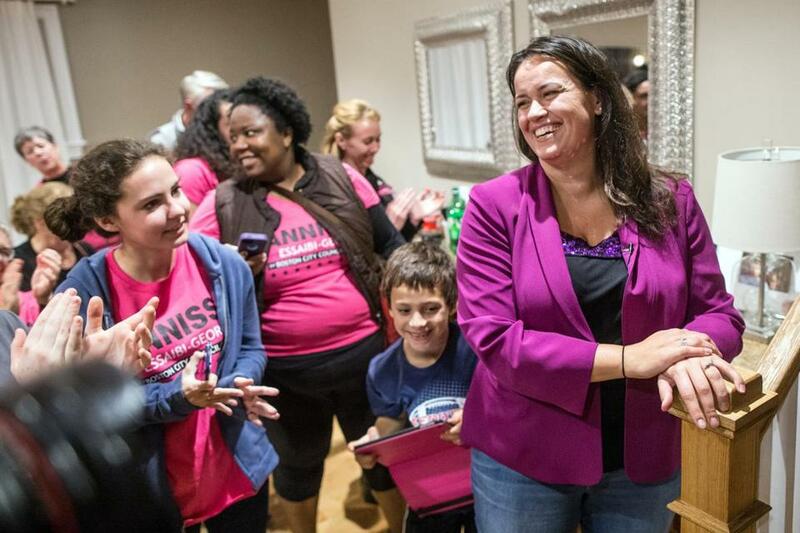 In District 4, voters said they backed Campbell because she worked hard for the job. “It’s time for a change,” said Gary Fredericks, a 63-year-old retiree who has lived in the Ashmont Hill section of Dorchester for a quarter-century. Yancey is the only person to ever hold his seat, elected to it in 1983. The 66-year-old grandfather of six arrived at his election night party flanked by family. “I think there are great days ahead,” Yancey said. Stephen Murphy and his wife, Bridget Simmons Murphy, were at Doyle’s Cafe. 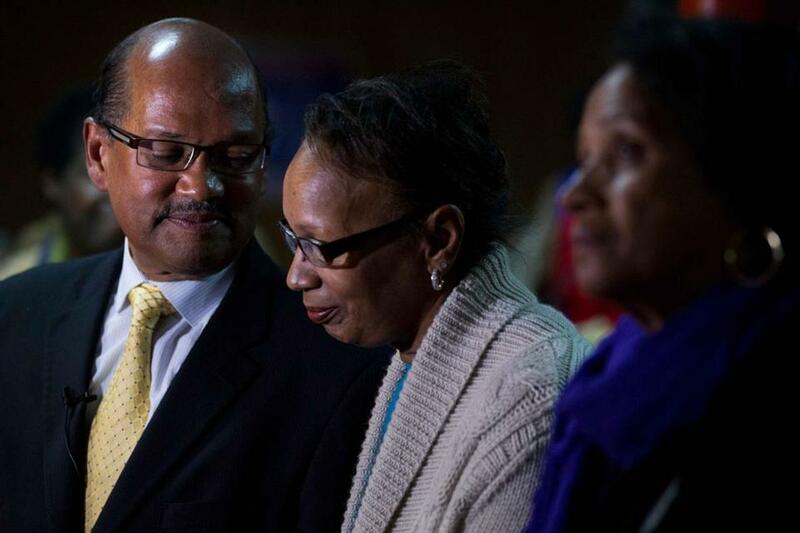 Charles Yancey and his wife, Marzetta Morrissette Yancey, were with supporters after the election. Astead W. Herndon of the Globe staff, and Globe correspondents Felicia Gans, Aimee Ortiz, and Sarah Roberts contributed to this report. Andrew Ryan can be reached at andrew.ryan@globe.com. Follow him on Twitter @GlobeAndrewRyan. Meghan E. Irons can be reached at meghan.irons@globe.com. Follow her on Twitter @MeghanIrons.